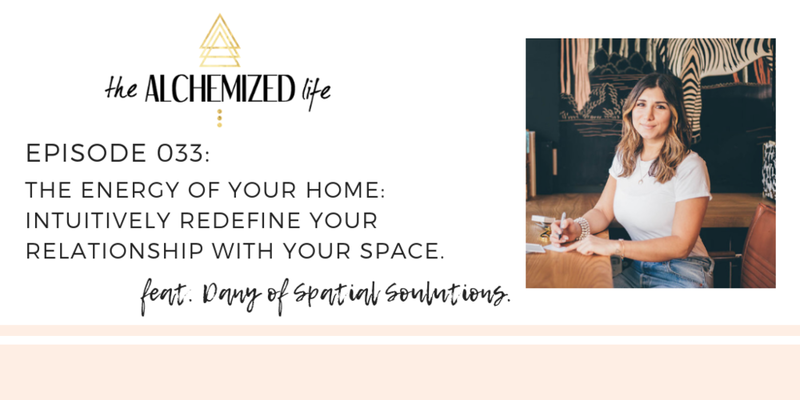 This week on the Alchemized Life Podcast we welcome Dany De’Andrea owner and founder of Spatial Solutions, a intuitive space planning service. Dany’s mission is to support people in redefining their relationship with their space. Her intuitive process releases people from physical and energetic clutter and reimagines the form, flow and function within their environment(s). Since starting this work, Dany has helped countless clients reclaim their sacred relationship with their space - elevating their productivity and inspiring their true potential. She has such an eye and makes redesigning and re-envisioning your space and the relationship you have to your things, such a cool process. Dany is located in LA, but recently opened up her schedule for virtual sessions so you can experience her intuitive spatial design from ANYWHERE in the world. She has also been kind enough to offer all listeners an opportunity to chat with her one-on-one for FREE. In this episode we talk about Dany’s story and how she started working with people on intuitive space planning. We discuss steps to start redefining your relationship with your space and the power it has on your own energy. In this episode you will learn how to invite more organization and balance into your space. Click HERE to learn more about Ava’s Unbreakable Confidence. Episode 032: Get High on Heart - How to Connect To Your Heart To Access Your Deep Intuitive Wisdom with Jessie May Wolfe.